This is a five-year-old boy with a style blog. And yes, he's more stylish than you'll ever be. And no, his name isn't Quinoa, and he's not imaginary. 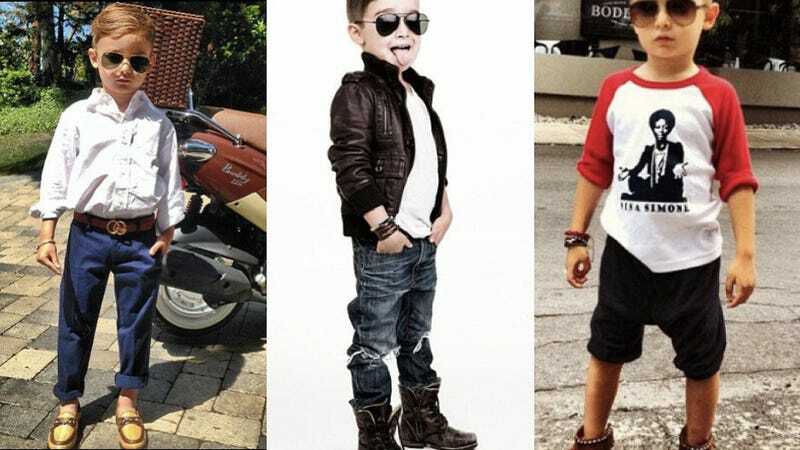 We've already explored the idea of children living out their parents fantasies in over-priced, mainly inappropiate (admittedly sometimes very adorable) clothing, but tiny fashion tot Alonso Mateo takes the cake. Congrats, you are the final person not posting a constant stream of selfies! The Laguna Beach resident was sired by a mother who has contributed to Harper’s Bazaar Mexico and Latin America and a father who is the owner and CEO of a private equity firm. Which, I suppose, is the perfect storm when creating the world's most fashionable child. Turn them down now if you want, Mateo, but soon you'll be just like Sally Fields in Soap Dish, all going to the mall and making Whoopi Goldberg beg for your autograph. Fame is fleeting. Kitson Kids, Dior, Gucci (“for leather jackets”), Stella McCartney, Bon Point (“French couture for kids”), Nordstrom, H&M (“for amazing basics”), Little Marc Jacobs (“amazing”), Dolce & Gabbana (“great”), and even Target. “As long as it’s nice quality, I’ll take it,” she says.